Das sehr nahrhafte Quinoa ist so beliebt geworden, dass die Menschen in Peru und Bolivien es sich nicht mehr leisten können... Schon mal gehört? Nun, dieser Artikel klärt auf, wie es wirklich um die Quinoabauern steht und warum man sich keine Sorgen hätten machen sollen, als der Preis stieg sondern eher jetzt, wo er fällt, weil andere Weltregionen in die Produktion mit eingestiegen sind (wie schon bei der Kartoffel, einem anderen nahrhaften Andenprodukt). 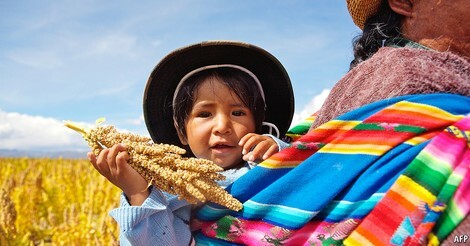 The idea that the Andes might cease to be the world’s main source of quinoa is not far-fetched. The potato, after all, originated there, but now 15 other countries, including Bangladesh and Belarus, produce more potatoes than Peru does. Yet Peru still produces around 4,000 varieties of potato, which foodies are trying to brand and market to Western consumers. The main hope of Andean producers is to carve out a niche in the market with their authentic, organic, “heirloom” quinoa, appealing to the same consumers who were warned away back in 2013. IS THE global fad for quinoa a bane or boon to the peasants of the Andes? For centuries they were more or less the only people to grow or eat the stuff.